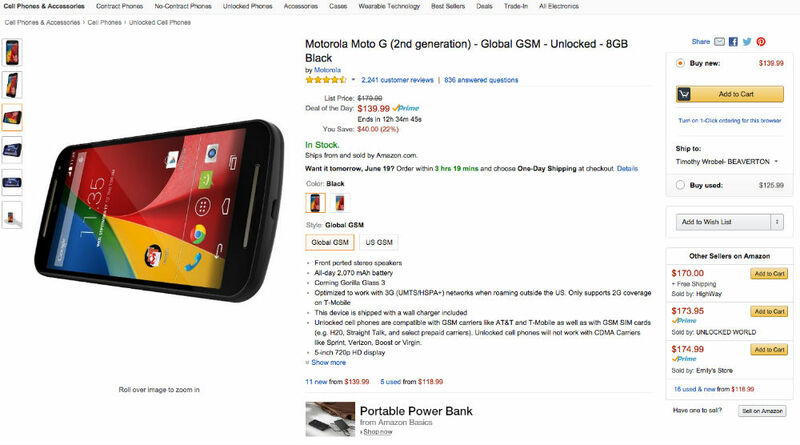 Taking place over on Amazon, you can grab a Moto G (2nd Gen) for just $140, down from its usual price of $180. The deal is available for both the White and Black models of the device. While the Moto G isn’t the most overpowered phone with crazy specs, it is a great phone that can be purchased unlocked for an even greater price. The Moto G features a 5″ HD display, Snapdragon 400 quad-core processor, front-facing stereo speakers, 2,070mAh battery, 8MP rear-facing camera, and HSPA+ radios. Before you ask, no, it does not feature 4G LTE connectivity. If you need a little phone for whatever reason, follow the link below to take advantage.